If you are looking for a great place to learn how to sail, check out the program at Shennecosett Yacht Club (SYC) in Groton, CT. Located next to UConn’s Avery Point Campus in beautiful Pine Island Bay, students can enjoy an easier early sailing experience with calm waters in the protective cove. In 2009, Bill Gaynor, SYC’s Director of Sailing, restarted the club’s junior sailing program. If Bill’s name is familiar, that is because he is the recently retired Head Sailing Coach at Stonington High School and previously worked as sailing instructor for both the Mystic Seaport and Town of Groton sailing programs. The SYC Sailing program has grown to include a total of more than 90 youth and adult students each season, although classes are generally limited to 16 or 17 students. Two senior instructors, who are US Sailing certified, and four junior instructors, work under Bill’s direction. The Sailing School offers three class levels: beginner, Intermediate, and Introduction to Racing. 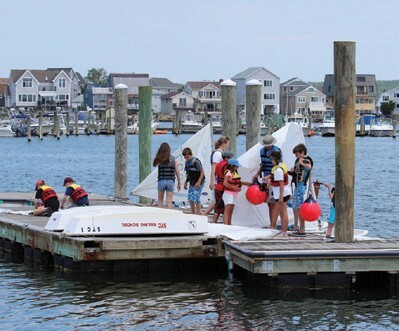 In addition, the Sailing School participates in local junior regattas and qualified students are eligible to compete on SYC’s team in Eastern Connecticut Sailing Association junior sailing events. Courses run from Monday to Thursday from 9:00 a.m. until 2:00 p.m., with a break for lunch. Lunch can be enjoyed on the club’s covered porch or grassy lawn. On the water training is held in the quiet cove of Pine Island Bay, which students access from the club’s safe and private docks. SYC maintains 21 boats for the sailing school, including Optis, Flying Juniors and 420s. 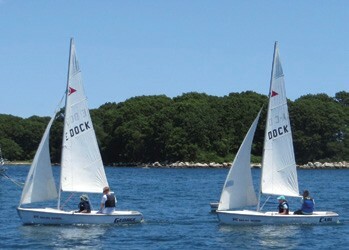 Boats can be used for practice, with appropriate supervision, at non-class times, by sailing school students whose parents are club members. Classroom training takes place inside the spacious clubhouse. Opti sailors rig up on the SYC dock. The annual sailing school picnic is held at the end of the program season for all students, their parents and families. Before the festivities begin, students are invited to sail, under supervision. Everyone then gathers for a cookout, certificates are distributed, and awards announced. To learn more about the program and see the 2017 class schedule, check the SYC website at syc-ct.com. Online registration and payment is available. Keep in mind that classes fill up early. The Sailing School Director, Bill Gaynor, can be reached by emailing him at sailingschool@syc-ct.com.